Although our flight to Guilin was on the same airline that flew us into Xi'an, this jet had the air conditioning on before we boarded. Cool. Guilin is beautiful. There is no other word. The limstone hills-- often almost like columns-- rise and fall abruptly, trees clinging to the otherwise bare rock. In many ways, the terrain here is reminiscent of the Three Gorges, and in some ways surpasses even that... in beauty, although not in size (I'm not sure anything short of the Himalayas could do that). We're told that this style of terrain covers only about 680 square kilometers. Our guide here in Guilin is named Chen, but we've dubbed him "Inspector Clouseau" due to his inexplicably French accent when he speaks English. Swear to God, he sounds just like Peter Sellers in the Pink Panther movies. I'm managing to refrain from asking him to say, "Kato, get off of me," but it's been quite a struggle. After a nap, I set out on the afternoon foray; Kat elected to keep napping. 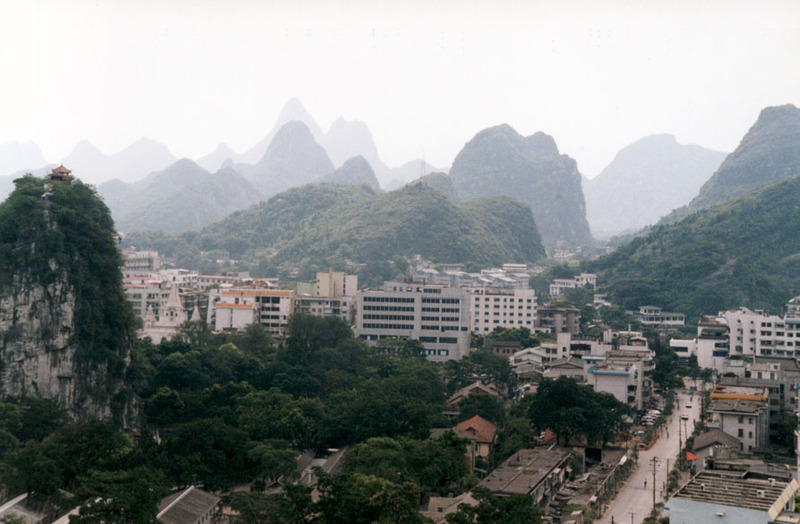 The foray involved climbing a rather steep set of stairs cut into, and built on, a stone column, to arrive at a truly spectacular view of Guilin, and the Lijiang (Li River) which flows through the city. The column I'd climbed was right at the river's edge, and I could see that it deserved its reputation for cleanliness, since I could see all the way to the riverbed from my vantage point, and the hundreds of people swimming in its water. Laid out below me was the city, nestled between the various limestone mounts. In a few cases, there were things on top of the columns, but these seemed mostly to be monestaries and radio transmission towers. There was a ridge of mountains along two horizons, and the river flowed between them, but below me. I guess it was worth the 250 steps up... but I hated to take them back down. For all the heights scared me, I wanted to stay for quite a while and just watch the city beneath me. Then we went to a Chinese "pharmacy." I put quotations there because the demonstration they gave us was strictly sideshow stuff-- they even did the "man exercises and becomes a conductor of electricity" bit. Then they tried to sell us medicines; for me, they recommended a skin cream to remove freckles. I was properly indignant, in an amused sort of way, that they would want to remove my freckles. I was also amused that their primary diagnosis should concern my skin, when it was my sinuses that were in trouble. Hmmmm.... how'd they miss a treatment to color my hair? Kat convinced me that I should go out for the evening, despite a metdown of my sinuses this afternoon. Good thing she did, too-- we saw comorant fishers in action, which was truly cool. Here's how it works: the fisherman raise comorants from chicks. Then they set out on the river at night with five or so of the birds, all perched with the fisherman on a narrow wooden raft. Each bird has a rope tied around its neck to exactly the circumference of the bird's neck, thus ensuring that they have no trouble moving or breathing. To fish, the birds dive and hunt as they would naturally. When they catch a fish, they return to the boat to eat (again, this is natural behavior; comorants eat out of the water). 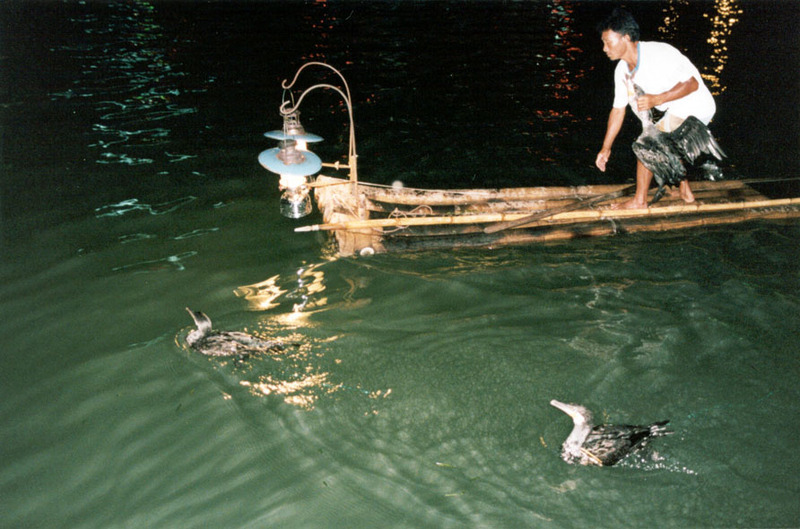 However, the rope tied around the neck prevents them from actually swallowing, so the fisherman just removes the fish from the bird's mouth and throws it into a basket. Then bird, still hungry and possibly a bit annoyed about losing its meal, dives for more fish. Quite ingeneous, really. We were able to see the birds diving thanks to the river's shallowness, its clarity, and a couple of Coleman lanterns hung from the front of the fisherman's boat. It was claimed that these attract bugs, which in turn attract fish, but I didn't see a single fish come near the boat. We could see the birds diving, but the only time they caught fish was out in the dark waters beyond the range of the lanterns. So the lamps were probably there solely to allow us to see the birds diving. I'm glad they were there; the sight was really neat. After returning to shore, we had time to shop. Again. Kat ordered a few chops for us, including a large "family" chop for the two of us. I waited on the bus.